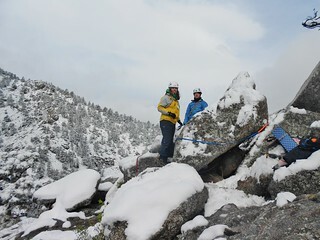 After their exciting multi-pitch day, climbing the First Flatironette, it was time to learn how to use prussiks to ascend/descend a rope, how to rappel, and how to pass a knot. 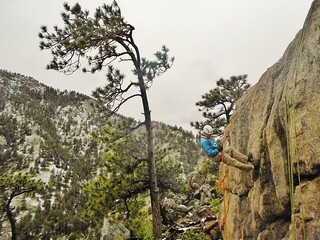 These basic self rescue skills are essential for rock climbers to know and could mean the difference between life and death. 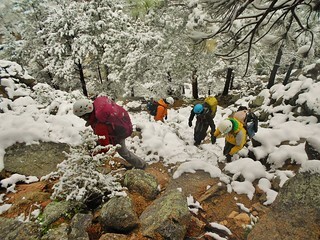 Unfortunately, for the students, they got some adversity training on top of their normal curriculum! 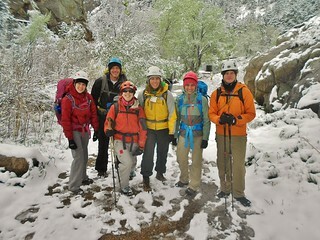 With a few inches of fresh spring powder, we were guaranteed a chilly start to our day! Our destination was the practice slab on the south side of the dome. It requires a bit of 3rd class scrambling. 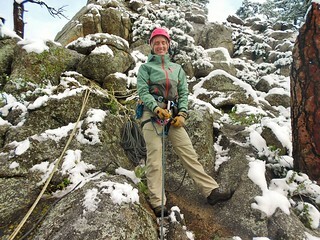 Here’s Becky Ready to Belay. The camera caught her with her eyes closed…but they were wide open a second later! Seth Helping Jill set up an anchor. 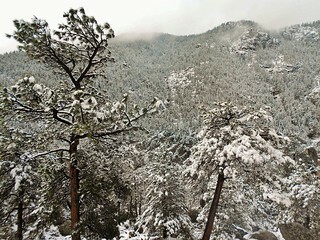 Mother’s Day Snow in Boulder Canyon! 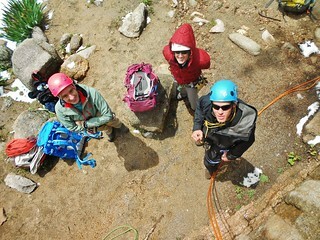 Jill giving Becky some pointers prior to her first rappel on vertical terrain. 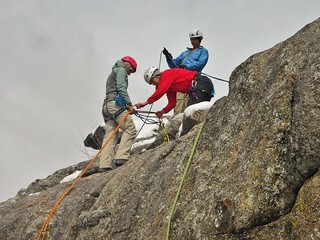 Seth is giving a Becky a back-up belay, just in case! 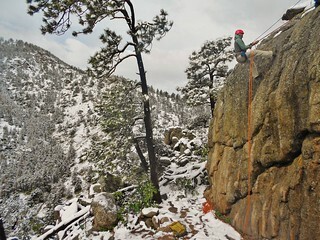 Becky rappelling. It’s tricky the first time, to ease over a lip! 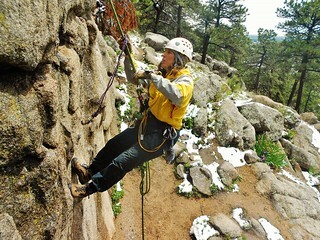 Jill demonstrating how to pass a knot or obstruction in the rope while rappelling. Becky, Elizabeth, and Peter watching the pass the knot demonstration! Seth is about to pass the knot. All the students had to demonstrate that they could pass the knot, in order to graduate from the Basic Rock Climbing Class. Success! Everybody passed the class and did a great job. Now, they are ready to climb! 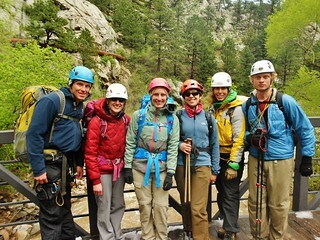 This entry was posted on Sunday, May 10th, 2015 at 11:09 am and is filed under Rock Climbing. You can follow any responses to this entry through the RSS 2.0 feed. Both comments and pings are currently closed.